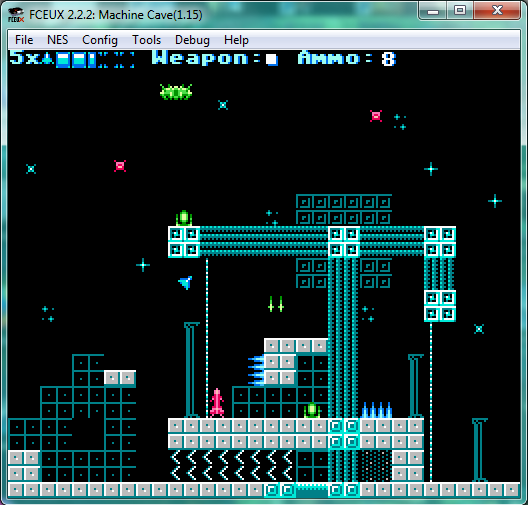 This game is a rom for NES (Nintendo Entertainment System) emulators. You will need a NES emulator to play this game! 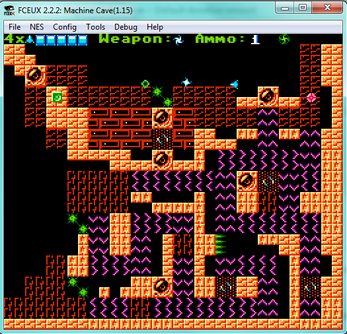 In this game you control a space ship through caves filled with various obstacles. Your mission is to destroy the 'machine heart' and escape the caves. There are various weapons and power-ups scattered about to improve your ship. It is a short but difficult game. A button accelerates, B uses weapon, LEFT and RIGHT turns the ship, UP and DOWN changes weapon, SELECT is used with a certain item and START pauses the game. This game is a .nes rom file meant to be run with a NES emulator. 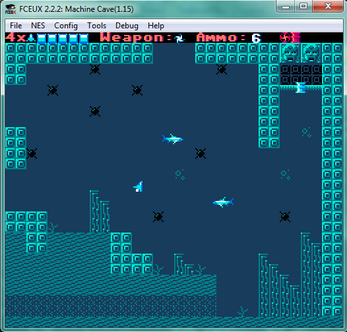 It is tested to work in fceux emulator. 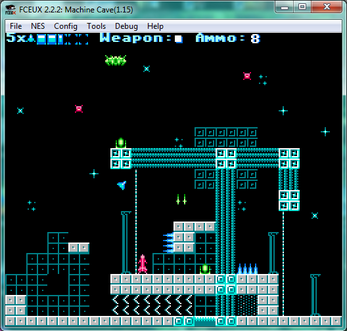 The game works in both NTSC and PAL modes. A slightly updated version, 1.16 is now available. A map layout was reworked to allow easier backtracking and make those 3 screens more interesting. Also, a physical release of Machine Cave is in the works! Version 1.16 had a tiny little error in it's code, so I made some changes. This new version 1.18 has another revised map, a door skip was fixed and the title screen changes color now! New version 1.19 has slightly changed water mine layouts, adjusted title palette change timing and bombs now make explosion sound if they hit ground. Machine Cave is quite the impressive work of art! Did you do all of this yourself? How long did it take? Yeees... It took me about 3-4 months to make everything. I had to learn a lot of new things from tutorials and nesdev wiki online. I wanted to make more content but writing the game in C limited me to using small cartridge types. I'm quite proud of how well I optimized and structured the program code. Some of the program code is 3rd party, such as the audio engine. Any plans on doing a physical release with the project? It's a NES homebrew made with NES maker? 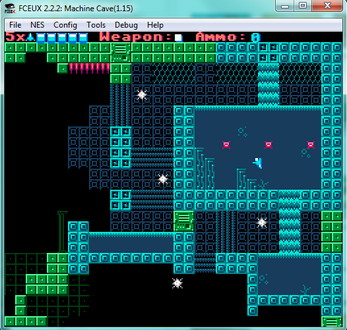 This game was written in C and compiled for the NES using cc65. The sound was made with FamiTracker and graphics with NES Screen Tool.